Enerquip is an international shell and tube heat exchanger manufacturer, building heat exchangers for sanitary, industrial and military applications. 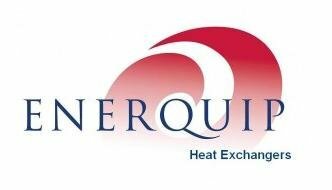 Enerquip's heat exchangers for the food and dairy industries are used in thousands of facilities in the USA, Canada, and Mexico. They comply with 3-A and BPE standards for heating or cooling WFI, milk products, and foods. Each 3-A compliant exchanger offers sanitary connections on the process side. All product contact surfaces meet a 150 grit #4 3-A finish as a standard (finer finishes are available). Internal surfaces are crevice-free to minimize corrosion and improve cleanability. In addition to supplying heat exchangers to these customers, Enerquip provides a full line of replacement parts for quick turnaround during plant maintenance shutdowns. Enerquip is proud to be a member of both Food Industry Suppliers Association (FISA) and the International Dairy Foods Association (The Wisconsin Cheese Association, IDFA includes the Milk Industry Foundation, the National Cheese Institute, and the National Ice Cream Association).